We received a lot of great feedback and ideas from our Takoma Connected community workshop back in September. To recap, our meeting had several breakout sessions for residents to discuss and share their feedback on important topics including community green space and building design. We’ve worked hard to update our design plans and made significant changes to the original concept plan based on feedback we received from community members . The revised design plans include an increased setback on Eastern Avenue and a larger landscape buffer to preserve mature trees near the property. Increased the Eastern Ave. building setback from 21’ to 30’ and fully incorporates the Metropolitan Branch Trail Plan along Eastern Avenue and Cedar Street. Eliminated the lay-by on Eastern Avenue. Eliminated the third travel lane to the WMATA and residential parking garages. Increased the landscape buffer for the property to the west from 5’ to 30’, allowing mature trees to be preserved and additional plantings to be made. Lowered the building height on Eastern Avenue and increased the step-back. 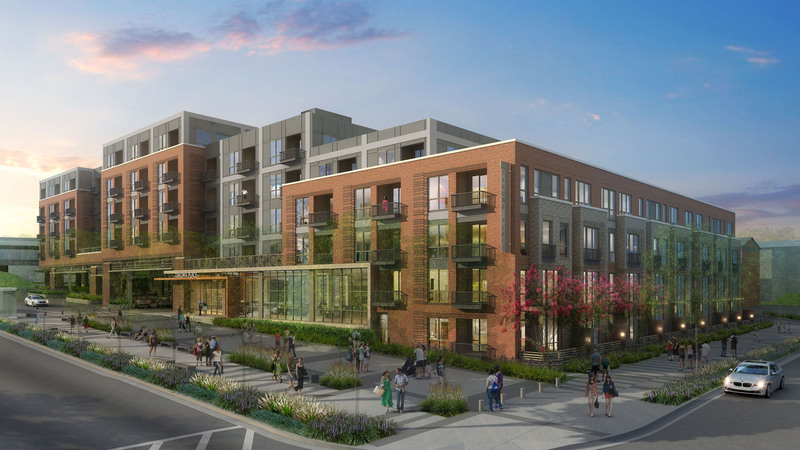 Moved the building entrance from Eastern Avenue to the park side of the building, allowing a more residential, direct entry townhome-type apartment. Screened and recessed the loading bays to allow better pedestrian circulation and eliminate conflicts with access to parking. Incorporated an internal residential drop-off. Eliminated the building and driveway bump-out to significantly increase the green area buffer to the west. Reoriented the courtyards to the west to break up the building mass to the neighboring apartment. Turned the fire lane between the building and bus loop has into a pedestrian plaza and incorporated bio retention features. Incorporated into the design planters on the ground and screens hung from the building to minimize the views into the parking area. Further reduced the residential parking ratio to .7 spaces/unit. We’re committed to working with the community throughout the development process. Feel free to email us at info@takomaconnected.com with questions or comments about the revised design plans. This entry was posted in Takoma, Takoma Park and tagged Community, community events, community support, connected community, Takoma, Takoma Park. Bookmark the permalink.